It's true that everyone likes to win, and no one ever likes to lose. That's just a simple fact of life. 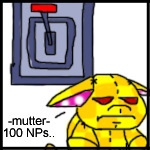 But really, isn't the whole point of participating in the Altador Cup, and in fact, all of Neopets, just to have fun?